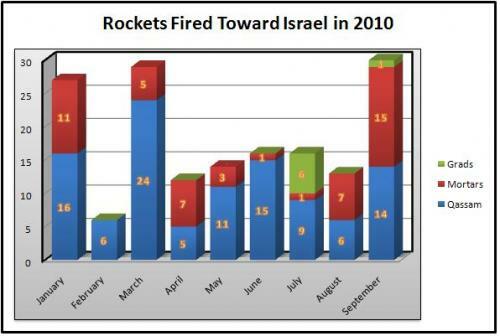 Throughout the year 2010, over 235 Grad missiles, Qassam rockets and mortar shells were fired from the Gaza Strip into Israeli territory. About 130 this year so far. 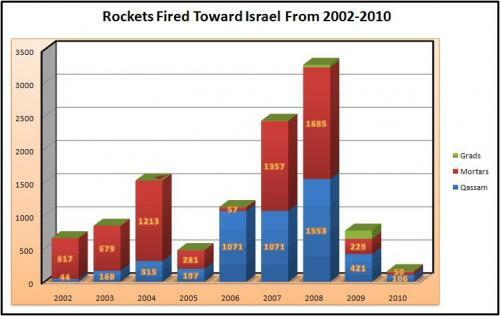 That's about 616 rockets and mortars fired over the past 2 years during the Hamas ceasefire. Of course, compared to the years before Operation Cast Lead, that would seem like a ceasefire. No matter how you look at it, there simply has not been a ceasefire. Nope. Not for a day. The Israeli government pretends its a ceasefire until the Arab terror becomes too blatant to simply ignore. Of course then the world starts bleating for a ceasefire. Tell that to the people of Sderot, Beersheva and Ashkelon. They would love a real ceasefire. Jerusalem: Which Of 61 Conquests Counts The Most? Cartoon: Who Will Exit First From Libya? Why Is Abbas So Eager To Join Up With Hamas? Tomorrow Is The Big Day: Buy Israeli Goods! Did Obama Peak Too Early--What About Syria? Protests In Syria: And So It Begins? The US Is In Decline--Enjoy The Ride! Classic: "The World Famous Story Of Purim"